How old is my Intel processor, exactly? First, let's look at these 287 NPUs, or math coprocessors - actually, we are looking at them from below (that is, they had been removed from their sockets and turned upside down). The upper one clearly bears an 8648 dating. The latter may look undated, but it bears as many as two datecodes. A first dating is "3743" (the first four digits in the upper number) while a second one appears below ("49"). 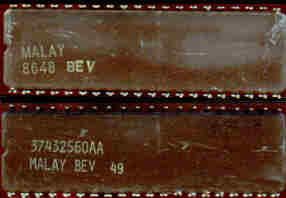 These are datecodes for year '87 and for weeks 43 and 49 respectively. This 486DX-25 bears a 9016 dating (year+week, look again at the first four digits of the upper number). But, the last printed number, "24", indicates a week as well. Such number is constantly higher by a few weeks than the other one. I don't know exactly if there is any relation between these two datecodes. But look at next example. These 387DX coprocessors (still looked from below) bear similar datecodes. The number in the last line, which looks as if it was impressed in a later moment, gives a year, and a week number. Thus these stampings stand for (198)9 week 42, (198)8 wk.18, (199)1 wk. 04 and (199)0 week 08 respectively. On later 486 CPUs, as we saw, the year's indication will be suppressed. The numbers on the first line also indicate year and week (they are lower by a few weeks, from 4 to approx. 20). The first year digit, in 386s, is sometimes changed to "9" (instead of 8), for instance one of my chips reports 9907 instead of 8907 as one would expect (manuafacturing year can't be 1999 for a 386DX-20!). 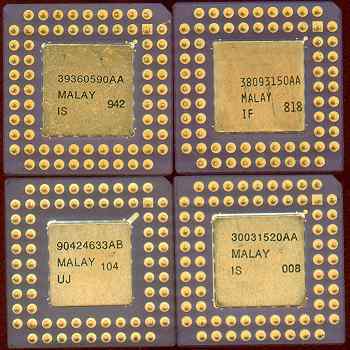 Other chips, as some of those pictured here, have "3" instead of 8 or 9 (cfr. also the 287 above). A first datecode is inserted within the long numeral (like 90424633AB) printed on the bottom of chips. The second digit within this number indicates a year whereas digits 3 and 4 indicate a week (they never exceed 52). Thus 38093150AA stands for year (198)8, week 09. The first digit also may seem to indicate a year (in some chips you may read 8927... or 9042....). According to some sources it indicates a manufacturing plant. However, it is rather surprising that, at first, the sole manufacturing plant was number "8" (in such datecodes like 8648, cfr. above). It was, clearly, just indicating a year date. Later, in all chips manufactured in Malaysia (those bearing MALAY), we can read either 9 or 3, instead of 8. This possibly indicates a second ("9") and a third ("3") manufacturing plant (9 and 3 appear to be related to the short alphabetic sigla appearing after the country indication: IS, BF, UJ, etc.). Later on, in the nineties, many chips will have 8 or 3, or even 5 or 7, instead of 9. This indicated further manufacturing plants had been taken into consideration. In any case, forget about the first digit, and look at the subsequent three digits, which indicate actual year/week of manufacturing. A second datecode, a two or three digit number, appears on the lower-right corner of the bottom. It indicates a week (sometimes a year as well) and it is constantly higher than the former datecode. Apparently, it was either impressed upon shipment, or after some checking process had been completed.